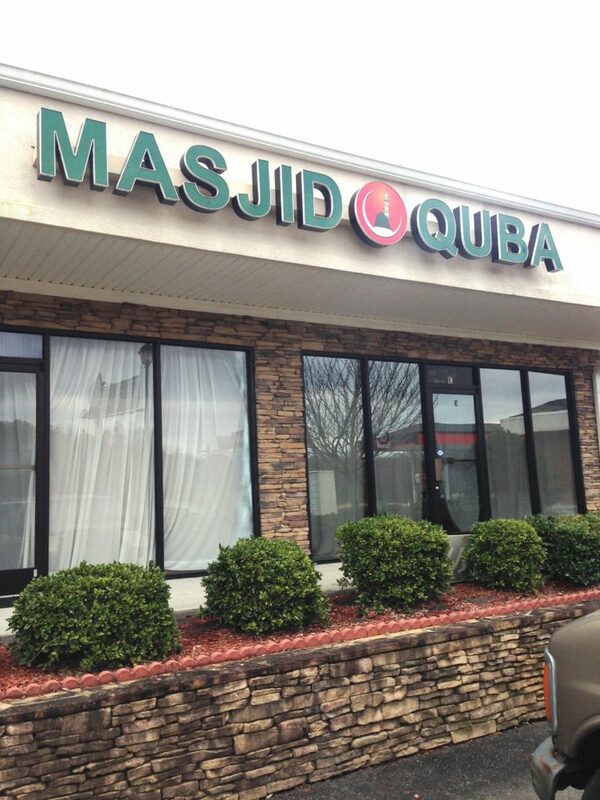 Near where I live is a mosque, called the “Masjid Quba.” It is in a strip mall on GA-20, off I-75. They have a sign over their storefront, and a two-part sign on the strip mall index by the road. The top reads “Masjid Quba” and the bottom is in Arabic script. Or rather, was. 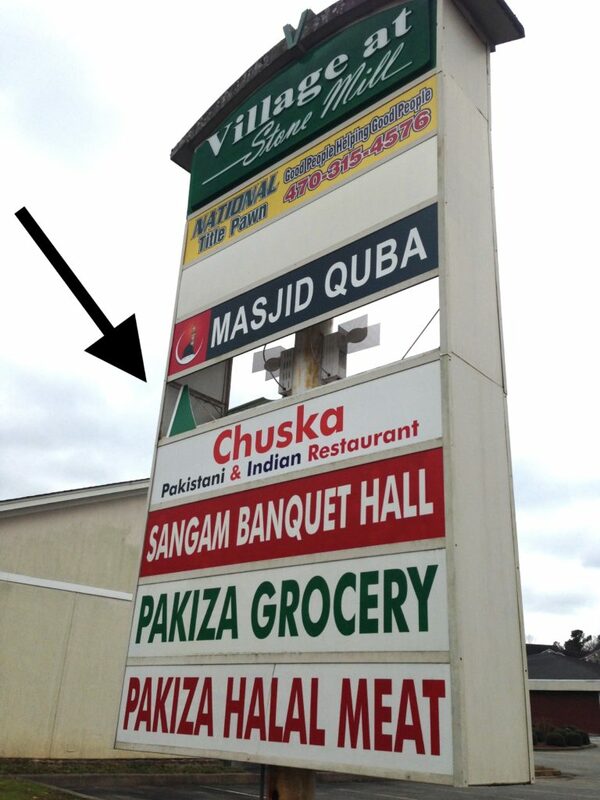 As I drove by today I noticed that “Masjid Quba” had been removed, and only part of the Arabic script sign remained. And on the other side, the Arabic was completely gone, although “Masjid Quba” remained. Were they moving out? 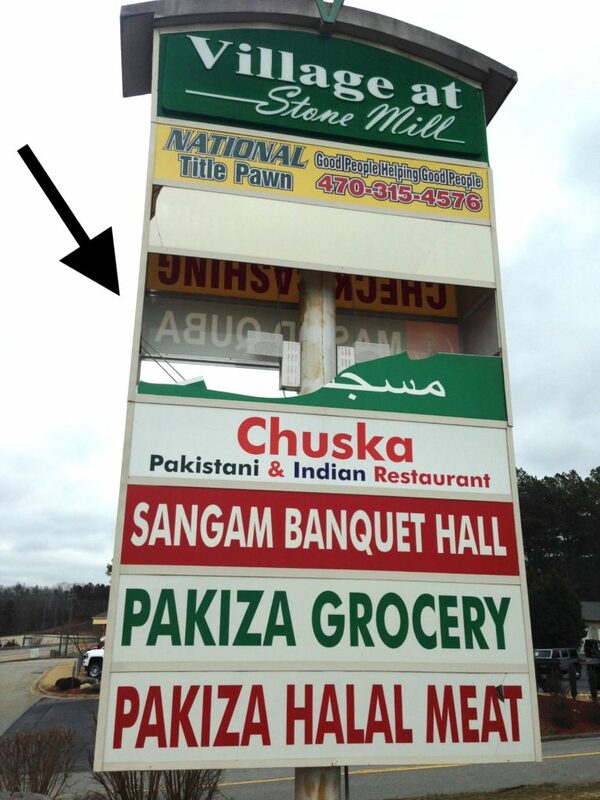 Probably not – Pakiza Grocery and Chuska Restaurant are no longer in the strip mall, yet their signs are still up. The broken sign at the foot of the index indicates violent removal. Could it have been the wind? Not likely – for the wind to take out both sides of the same sign, while leaving everything else intact, would make for a very freak wind. 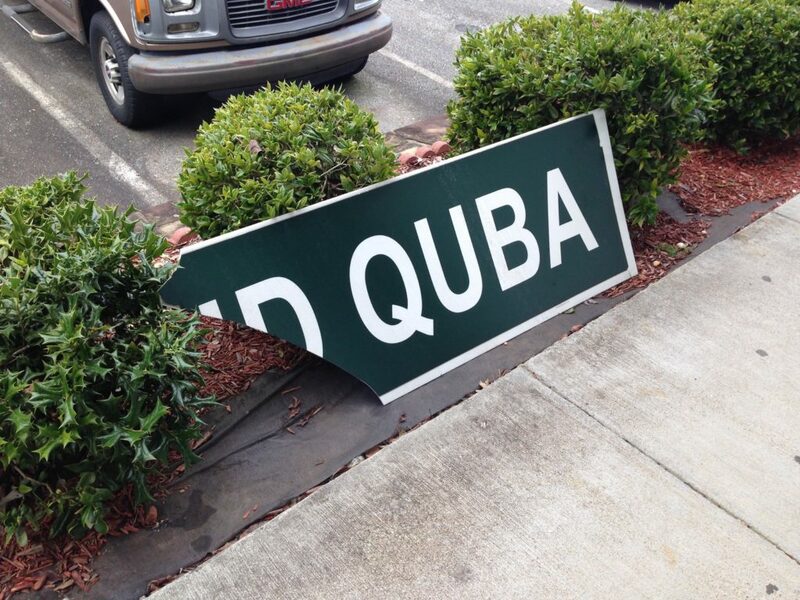 The fact that one broken part of the fallen “Masjid Quba” sign was placed directly in front of the mosque’s entrance suggests that human agents were responsible, and that this represents an act of vandalism. The metal pole in the photo above was likely the instrument used. So what is going on? A friend thinks they did it to themselves to get sympathy. Another posits that it was intra-Muslim factional violence, or that they may have owed money to someone. But given the fact that this was directed against a mosque, in a part of the country where the overwhelming religion is evangelical Christianity, suggests that it is an example of what the newspapers call a “hate crime.” If so, it is rather disappointing. The Bartow County Sheriff’s Office and FBI are investigating possible hate crimes. The Federal Bureau of Investigation has stepped in to assist detectives in determining whether acts of vandalism at the are hate crimes, which are federal offenses, Sgt. Jonathan Rogers said. 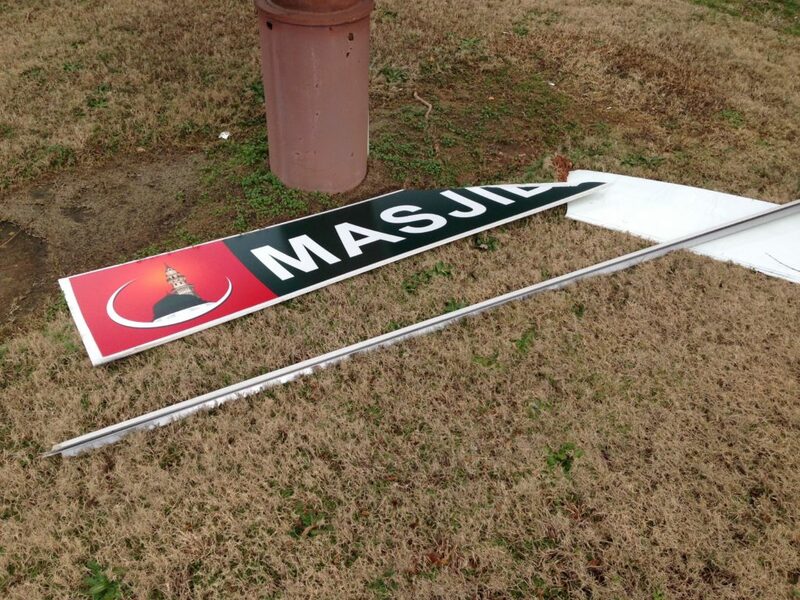 The mosque twice has been the target of vandals in the past few weeks. The first incident, on March 18 or 19, involved messages such as “Muslim Murders” and what deputies called racial slurs. The morning of March 19, a worker at an adjacent business noticed several windows had been smashed along the front of the building on Merchants Square. Two messages, including a drawing of the Star of David, had been written on the windows, and concrete and bricks that had apparently been thrown through the windows contained “racial slurs,” according to the incident report. In the second incident, deputies Tuesday retrieved four large rocks used to damage the center the previous night or early that morning. Four glass doors and windows in the front of the building were damaged. Of course, this is pretty small potatoes on the grand scheme of things. 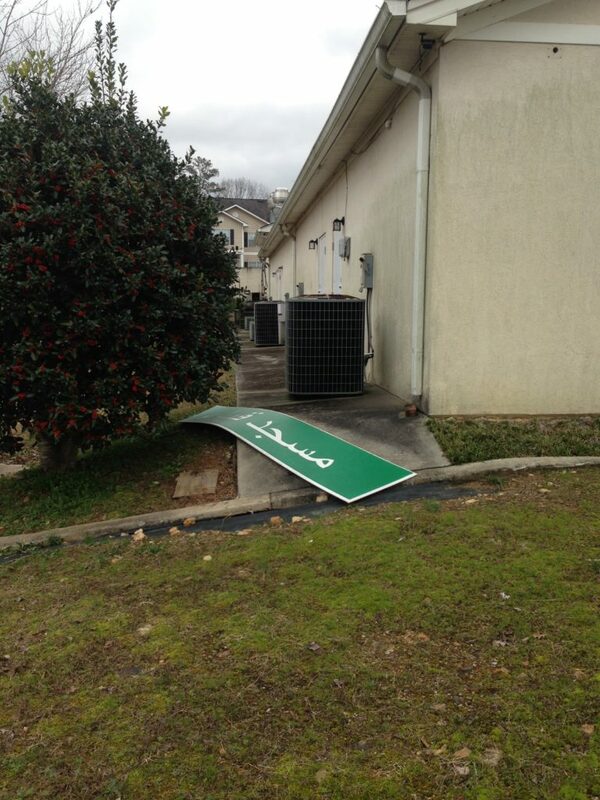 Muslims in Cartersville, Georgia do not have nearly as much to worry about as, say, the Copts in Egypt do. But it’s still an ugly and shameful incident. It’s a free country, dammit! Their rights are your rights. Don’t do stuff like this! I snapped this picture in 2015, of a church sign on GA-140, illustrating an attitude that (I guess) is all too common around here. 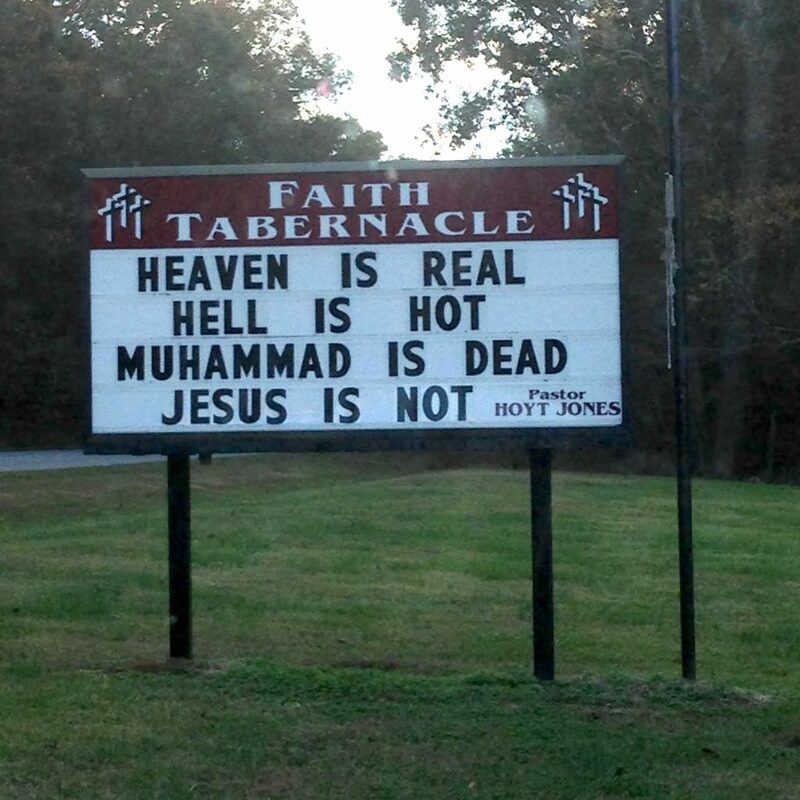 Of course, the fact that Muhammad is dead is the entire point of Islam, and I still maintain that you don’t need to run down someone else’s religion in order to promote your own, especially in a place where the only presence of that religion is single mosque in a strip mall. This entry was posted in Cartersville, Current Events, Religion by jgood. Bookmark the permalink.